What is a Programming Project? When a programmer sets out to start writing some code, technically the only thing he needs is a basic text editor and a compiler. This is sufficient for starting out programming or for writing small scripts and such, but it has its limitations. Sooner or later the programmer is going to want features such as easy management of many files of code, the ability to debug, and library linking or creation. All of these features are generally crammed together in what is known as an Integrated Programming Environment (IDE). The IDE generally takes care of all the syntax-highlighting, formating, code-completion, compiling, linking, and debugging. Most of these could be stand-alone utilities such as the Gnu Project Debugger (gdb), but it is generally more useful to have them all in one place. Some examples of IDEs include Emacs, Microsoft Visual Studio, NetBeans, Vim, Nano, Notepad++, CodeLite, and Code Blocks. Most programmers will tend to focus on mastering and customizing a few varying usage based on their current need or by what's available. When starting out programming it's generally good to explore multiple IDEs and to learn what older and more experienced programmers use. Managing Projects in an IDE Most IDEs will have a default set of "project management." When you are a single programmer, this can be sufficient. Customization of variables such as where the executable is run while debugging or project names can all be customized from within the IDE. Not knowing the intricacies of the particular IDE can lead to frustration though. Things such as renaming a folder or moving it to a different computer can "break" a project forcing it to be rebuilt and the code copy and pasted over or imported into a new project. This wastes time and is inefficient. 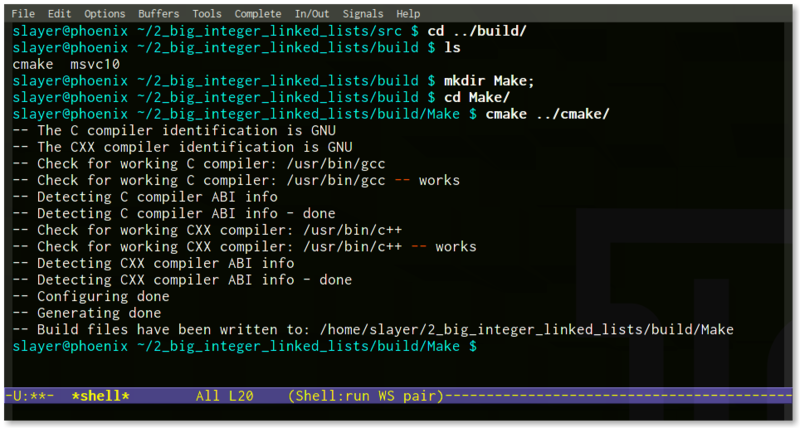 Fortunately there are tools such as cmake and Make that allow a programmer to define their own projects in a platform-independent manner. Here is my cmake file. My goal is to make it general enough to be able to be used with little or no modification for all my programming projects. I've been working to develop a cross platform way to build code and develop projects. Here is the CMake file I created to do that. It should be stored in your ~/templates folder. I created this script to assist me in automatically creating projects for me so I can repeatidly build projects exactly the same and not need to do the manual labor of physically creating every folder and file. I first created this program in my CSI class at UCF and as such there are current add/replace with specifics to that course still in place. I intend to clean this file up and make it more general and more user friendly. Right now it just works. This is the C File I use with my bash script to generate my projects. # Purpose: Automatically create diretory hiearchies with templates for projects. # Usage: Run this from the base directory of the project. # What type of program it is. # Opens files in freemind & emacs after creation. # Prevents cmake creation for C & C++ projects. echo " -Creating folder hiearchy." echo " -Building a C Project"
echo " -Making Project ""$PROJECTNAME"""
echo " -Building a Java Project"
echo " -Building a C++ Project"
echo " -Setting custom template info"
echo "Files Added, Current Directory Structure (cmake to be added):"
echo "Files Added, Current Directory Structure:"
sed -i "s|defaultcoursename|COP3502C\ Compute\ Science\ I|g" src/"$PROGRAMNAME". "$EXT"
sed -i "s|defaultcoursename|COP3330\ Object\ Oriented\Programming|g" src/"$PROGRAMNAME". "$EXT"
echo "----- Starting New Programming Project Program -----"
echo " Date = $DATE"
echo " Month = $MONTH"
echo " Time = $HOUR"
echo " -Reading in Program Arguments"
echo " -Setting Program Name"
echo "Please name a project, use flag proj then project name." echo "----- Ending New Programming Project Program -----"
##echo "\tdid not find slides"
##echo "\tdid not find asignment"
Cmake.org. CMake Logo Triangle High-Res PNG Image. Accessed May 21, 2012. http://www.cmake.org/files/logos/CMake-logo-triangle-high-res.png.